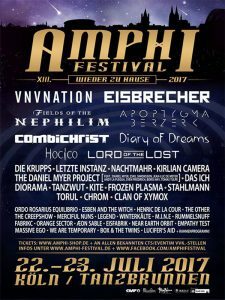 I’ll be present as photographer for full coverage at Amphi Festival later this month. Don’t know this festival ? It attires more than 16.000 persons in Koln, Germany at Tanzbrunnen venue on July 22 and 23. It’s one of the biggest german festival for Gothic and Alternative music. This year’s line-up includes VNV Nation, Die Krupps, Eisbrecher, Combichrist … and more !